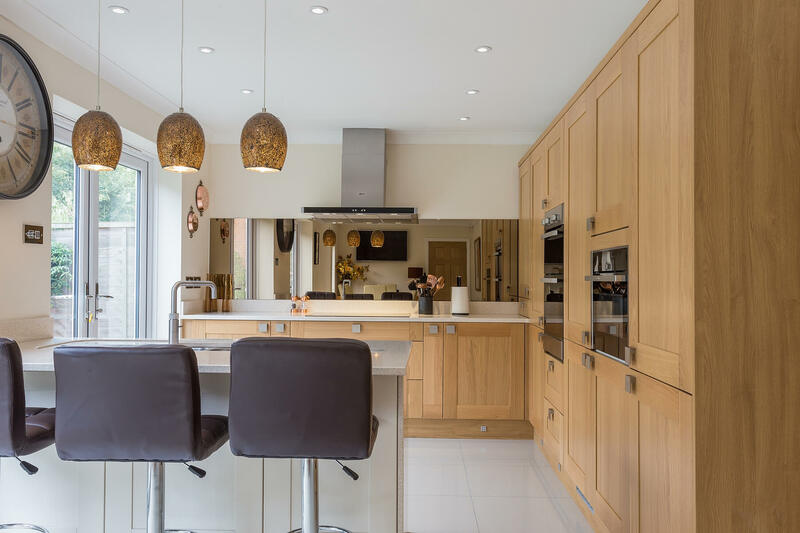 A long-awaited extension to improve the layout of their property, our clients were excited to create a classic, timeless kitchen which would be the hub of their home in Hertfordshire. 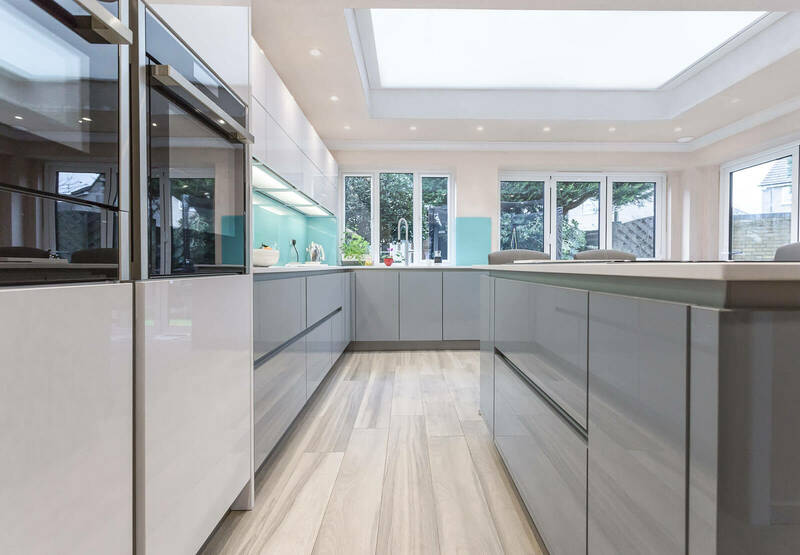 Their new designer kitchen was to be housed within a huge extension, which would also act as a dining area and family room, with patio doors leading out into the raised garden. Their vision was to have a new social hub of the home; an area for entertaining with a seating area around an island. Our clients were keen to keep the colour palette light, with concerns that the room may appear dark, as steps leading up to the raised garden were blocking the natural light from coming into the room. They wanted a traditional painted shaker kitchen, but one that created a statement when you walked into the room. 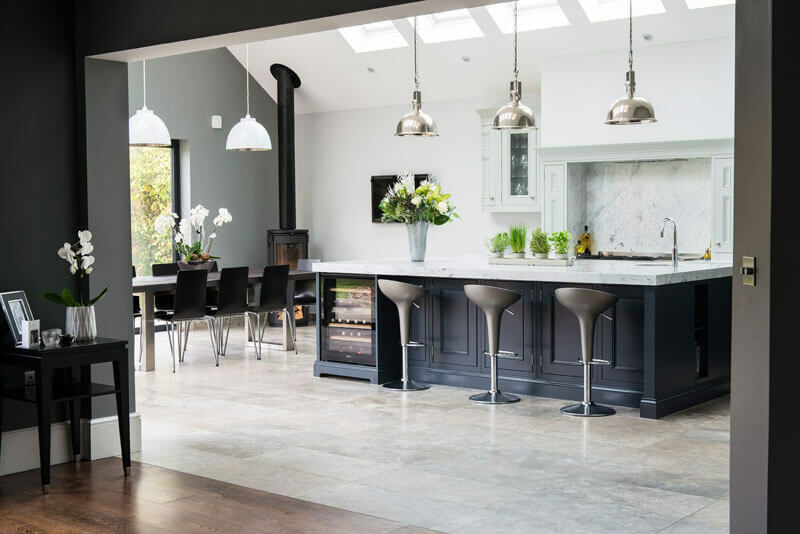 The new extension was an impressive size, but as it was to be a dual-purpose room, the kitchen should not dominate the room, but enhance the space. 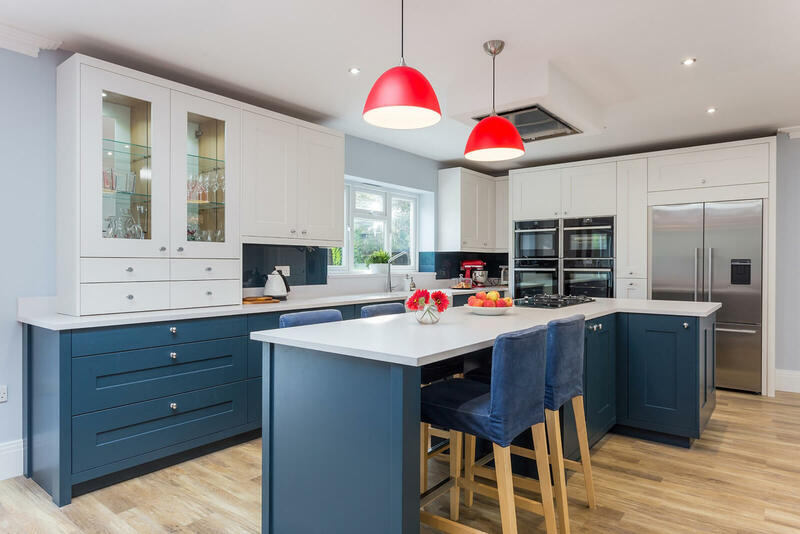 Our clients were keen on the painted shaker range of kitchens we have on show in our showroom in Cheshunt, Hertfordshire, and our Milbourne door, a classic painted shaker design which is enhanced with subtle woodgrain, was the perfect choice. By using a statement colour just on the Island, this created an impact without dominating the room. Hartforth Blue is a perfect colour to create a dramatic impact and combines well with many other colours, creating a beautiful two-tone palette. Partridge Grey is a neutral but on-trend colour which gives a subtle and unfussy finish to the rest of the kitchen. Our kitchen showroom has many displays showing the latest colours. The kitchen was to be placed on a long wall to one end of the kitchen - the temptation was to place tall larder units along the expanse of the wall which would give an excess of storage possibilities. However, we decided a feature wall with exposed brickwork and oak to break up the long span of units was worth the compromise on storage - this area really makes this kitchen stand out from the rest. A butler sink complements the traditional nature of the Milbourne kitchen range, and is enhanced with an instant boiling water Quooker tap - no need to wait for the kettle to boil in this kitchen! White Quartz worktops are a sophisticated choice to complement this kitchen without detracting from the impact of the Hartforth Blue island. Glass splashbacks were custom painted to match the wall paint colour, providing protection to the walls without detratcing from the smooth, unfussy lines of the kitchen.